Do you desire deep defined waves? Satisfy your urges and Fixx yourself with our Malaysian Body Wave. In the Virgin hair industry, Malaysian Hair is one of the leading hair types. Malaysian hair is medium to low luster so it blends better with natural hair. It blends easier as well because it is slightly thicker than Indian and Brazilian hair and is not as shiny as them either. This allows for an easier blend with an individual's natural hair. 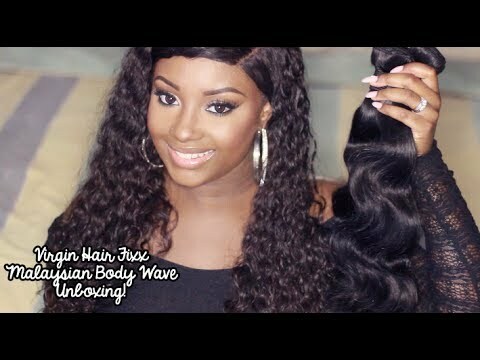 Body wave is one of the newest textures and one of the hottest trends right now. Our Body Wave has a distinct and defined “S” pattern. Where Malaysian wavy hair has a sporadic and thinner “S” pattern, Body Wave is going to have a loose and flowing “S” pattern. This allows for easier styling and provides more options for styling. Just as with all of the rest of our texture options, you are able to straighten this hair and even curl it. Keep in mind that when you wet the hair it will return back to its natural texture and wave pattern. Don’t want any ‘leave out’? Want to protect your hair? Do not worry! We also carry Body Wave Lace Closures. We do suggest at least 2 – 3 bundles for a full install, and at least 3 – 4 bundles on lengths longer than 16”. We do offer a large variety of options with our Virgin Hair Bundle Deals. Our bundle deals satisfy a wide variety of needs at the same time saving you money!